In a medium bowl, combine corn muffin mix, eggs and milk. Reserve. Fill 8 ramekin dishes 3/4 of the way with chili and top equally with bell peppers. Pour corn mix over chili, fill to the rim and spread until chili is completely covered. 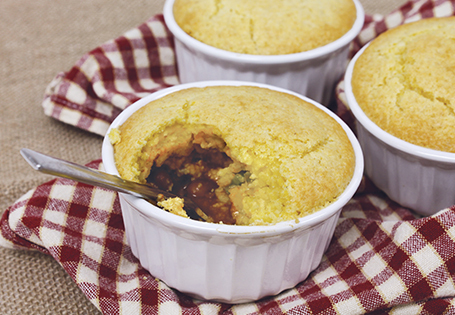 Bake for 25-30 minutes or until cornbread is golden brown.